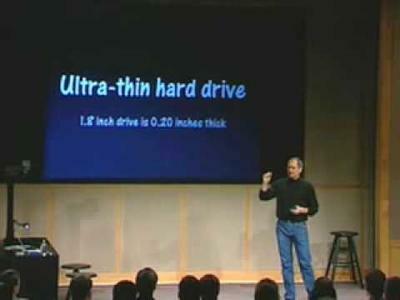 It's amazing to take a look back into the history of Apple some times. We have gotten so used to the slickness of the presentations, that it's hard to remember the old days when the company wasn't in the best of financial health. The company was starting to get healthy again, but it sure wasn't the company we all know today. The introduction of the very first iPod back in 2001 is a great look back at that time, and it also helps you realize that Steve Jobs must own about 500 sets of this black turtle neck and jeans combo. While the presentation sounds so familiar, there are also some things that really stick out like how he though 1,000 songs on a 5 GB drive would hold your entire music collection. Makes you wonder why there's a 160 GB version now, doesn't it? You also have to chuckle when he mentions "skip protection." While the Classic line of iPods are still using physical hard drives, everything else has moved to flash memory, so not exactly a concern any more. The part that makes me really break out in laughter is his excitement over the fact it uses FireWire for the data transfer. Yep, Apple developed the technology as he mentions in the video … I wonder if he would still lay claim to it if you asked him today? Of course this was back when the iPod was only compatible with Macs, and USB was indeed slower at that time, so FireWire made sense, so you can't give them too much grief for making that choice. It is interesting to see the charger hasn't changed too much over this time except to get smaller and switch to USB. Considering all of the other design changes over the years, especially to the iPod itself, I guess you can say that Apple got the charger right on the first try. Nine years really isn't that long of a time except in terms of technology. We have seen the iPod change dramatically over the years, and though the iPod Classic still follows the same basic design of this first generation device, I would imagine it isn't going to be in the line-up much longer as it is the last to use a physical hard drive. It will be kind of sad to see it go as it will be like saying goodbye to the original MP3 player that shaped the entire industry, but it will have had a good long run of it, that's for sure. Sept. has become the traditional month for Apple to unveil the new line of iPods each year, and who knows what this year's grouping will consist of, but it is fun to look back at the first event and have a bit of a chuckle.